Is Your Veterinarian a Cowboy? Was that an African Wild Dog…?? No silly that’s Market Street Animal Clinic, a single doctor Veterinary Practice. Is the single doctor practice an endangered species…? In both human and veterinary medicine this does appear to be the case. What does the steady decline of these practitioner owned offices to larger and even corporate owned groups mean? Is this leading to better care? More affordable care? Where have all the Cowboys gone? At Market Street Animal Clinic we believe maintaining our intimate size allows us to pack a better punch for our community, our patients and their families. Also and very importantly we like to think we can have a better impact for our team. Our practice can maintain a quality work life so that our team is energized with compassion at all times. We know that different practice philosophies work for different teams, patients and families. Veterinarians like family doctors can set a tone for our experience. It is important to Dr. Katie that she writes and reviews all of her own medical records. This keeps her connected to her patients thus leading to more thorough care. We do not cut and paste. Additionally, we review and discuss every outside record or report that comes in to our clinic. This includes records that accompany new patients, records that come from having been to a specialist or visiting the emergency room. Yep a real life cowboy! 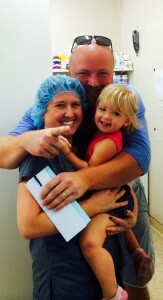 Dr. Katie is proud to be the mother of two beautiful girls and a devoted wife and daughter. 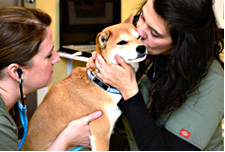 She chose to relocate to Leesburg 7 years ago when she took over Market Street Animal Clinic to be near her parents. Her family values are a part of what sets her apart as a business owner and a veterinarian. The gifts that Dr. Katie brings to Market Street will sometimes mean she has to take time off at the last minute. We are sure many of you have experienced the need to re-schedule appointments or make last minute cancellations… we are always happy to accommodate busy schedules! On the occasion that Dr. Katie is out of the office unexpectedly we are grateful for your support and understanding. Market Street Animal Clinic works to maintain a stress free and relaxing environment for our patients and their families. We offer texting service for those who prefer to wait outside or come directly in to the exam room. We offer special snacks for your pets to keep their minds occupied with cheese and other delicious treats during the visit. Market Street is an open environment – our little yellow house is your house. Anywhere you and your pet are comfortable is where we will be. We use special cleaning tools and pheromones to make our environment as pet friendly and fear free as possible. Dr. Katie and our team practice forward thinking medicine and patient care tempering experience with continuing education to provide modeled veterinary care.